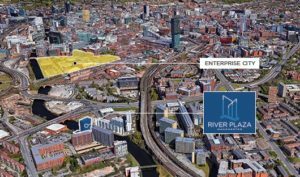 Already one of the most sought after areas to live and rent in Manchester, Castlefield is to see further demand with the announcement of Enterprise City. Enterprise City comprises of 1 million sq.ft of office space across 10 buildings and 10,000 new jobs to be created in the South of the city centre. A state of the art office space is designed to attract further global brands and will make up a new tech, digital and media hub. With household names such as e-commerce giant Booking.com moving their new global headquarters here and WPP the World’s 2nd largest advertising group moving to Castlefield, this already coveted district of Manchester will see a further influx of professionals. As one of Manchester’s leading developer’s, we strategically place our residential developments in prime city centre locations and also areas earmarked for future growth and gentrification. With the announcement of Enterprise City, our River Plaza residential development now ticks both of these boxes. JLL have forecast residential property to grow by 28.2% by 2022. This would be the case for any area within the city. For a continuation of this growth or a ‘second wave’, it is important to look at gentrification and regeneration areas. Where is the demand going to be sustainable? Which part of the city is going to keep evolving? From River Plaza, a short walk along the river brings you to Regent Road and extra few minutes brings you to Enterprise City and the heart of Castlefield. Whether your property purchase is to live in or for a buy-to-let, it is always an investment. Investment is about timing and location – which is key to this development. This will always sit in a prime, Manchester City centre location and is couples with sustainable, long term growth. Sign up to our regular newsletters and be the first to receive details on new property launches and development updates. Victoria House, New Development Announced !